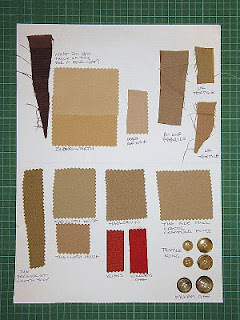 Making My 5th Doctor Costume: Five Coat - what’s in a colour? Five Coat - what’s in a colour? Right – at long last I am back onto my Five Coat after a bit of a delay, and I have got a feeling of Déjà vu. It’s colour all over again! The hold up has been because, stupid as it seems, I have had difficulty sourcing a good beige gaberdine to use for the body of the coat. This was something I had problems with on the Tennant Coat, and I wrote about it in What’s In A Colour? The whole time I have been working on the Five Coat I have been searching fabric shops and online retailers to try and find the perfect match. Now I would have thought this to be a fairly simple task – after all, beige is a byword for dull, safe, middle-of-the-road, easy – need I go on? 1. very light brown, as of undyed wool; light gray with a brownish tinge. 2. of the color beige. But it has proved to be a bit harder than I thought. The problem has been compounded by the need to find a fabric of the right weight and feel, coupled with the right colour. I have found a number of stretch gaberdines in good colours, which boarder on being a jersey material, and not the right thing at all; I also found some great pure gaberdines, which lacked the colour range I needed. In the past I have learnt to my cost in the past that when you are looking for a specific fabric/colour combination, not to buy the first material you see, because once you get it home and start looking at it objectively you can find that your choice was a bit off. It is much better to go out without the preconception to come back with fabric ready to cut, but to gather swatch samples and asses their individual merits before returning to make your purchase later. You do, however, need to put a time limit on this process, otherwise you may return to find all of your choice sold without the chance of new stock being ordered. I therefore, when following this path, tend to steer towards suppliers with large stocks or known, named brands that can be re-ordered from their manufacturer rather than a distributor. Now, the problem with trying to match a relatively light and neutral colour like this, where it is neither one thing nor the other is simply that: a strong colour is easier to hit, such as the colours of a Six Coat; but a neutral can have a slight bias of hue to it, be it warm or cold, grey or green. What is he going on about, I can hear you saying! Surely a beige is a beige? Well, I have gathered over 25 samples – all of which you could call beige in isolation, but when they are put along side each other, are far from similar. I also had a friend in the US searching his side of the pond for me, and we both made it our mission to track down the perfect colour. He did rather better than me, I must say. Throughout this entry you will have notice the boards of samples we have found, and appreciate the variation of colour between them all. On one of these boards also has the piping I will be using, and a shortlisted range of buttons. Another factor (though for me it is sometimes irrelevant when you are aiming for the best) is the cost of the fabric. The variation in price can be notable, form over £30 a metre, down to £7 or £8 at the cheaper outlets. At one point I went to some fabric suppliers on Saville Row, and was quoted over £60 a metre for some gaberdine-like fabric, that was not the right colour anyway. I also tracked down the company that makes the fabrics used for British Military uniforms. Their prices are very keen and they stock some great materials including worsted twills and coating Meltons, which if not now I can see myself using in the future. Sadly, despite having a colour that was a contender, it was only in a Cavlery Twill, which is a very heavy fabric indeed. In the end, after going form pillar to post (and finding some superb fabric merchants along the way), the fabric we have settled on has been sourced in Los Angeles, and is on its way over to me as we speak.